Today I got to color this beautiful H251 Tall Tulip from Great Impressions. It was so fast and easy to do. 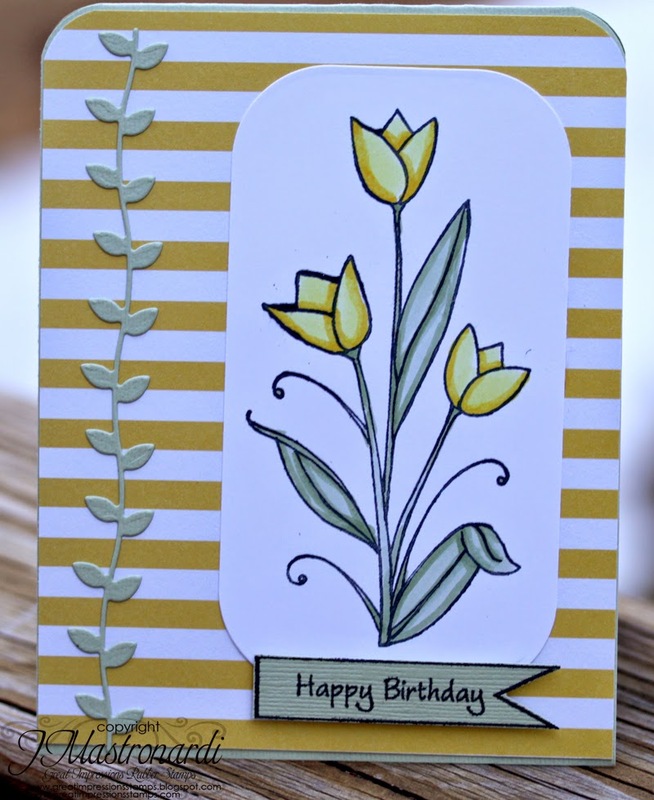 After coloring the tulip, I die cut my focal image and placed it on striped yellow paper. I added a die cut vine for interest. I could always use a birthday card so I used the G483 Tag sentiment. You still have time to join our challenge here. Hi ya peeps, it's my turn to share a project with you. Rain, Recycle and Rubber Boots. April showers bring May flowers and when it's raining you need rubber boots and recycling is a new trend in the crafts world. I recycled an image I've used before, changed a little bit of the color and added a pretty background. The image is called Spring Boots F545 and it's one of my favorites. I colored the image using copics and I added some mulberry flower and seambinding ribbon. Have you ever recycled using parts of an old project? Give it a try! there are lots of great inspiration projects to help you get started. Hi my sweet Great Impressions friends and welcome to my first EVER tutorial. I love using dies and stamps, but sometimes either the die doesn’t fit exactly right or I want to highlight an area of the stamp. How do I do it? I use the Out Of The Box technique and this is how it is done. 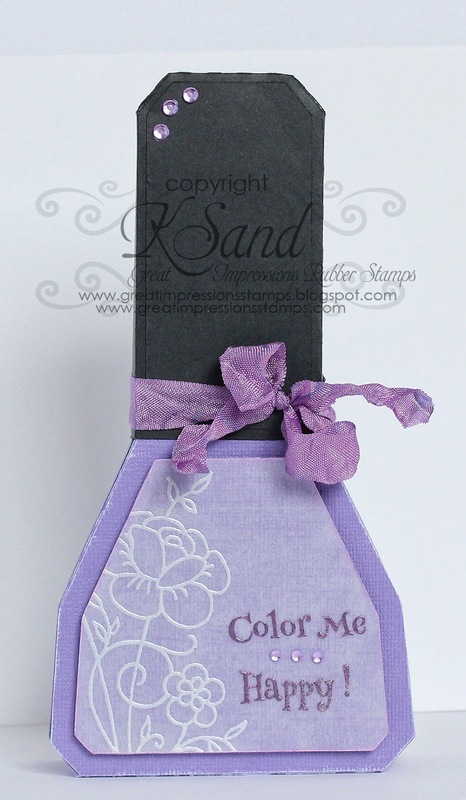 Once you have chosen your stamp and die, decide which part of your stamp will be "outside the box" and line it up. In my case, I have part of the flower and the leaf on the outside (I have marked the area outside the box in red). Using a pencil make small, light pencil marks on the INSIDE of the die where the image and die meet. You should have two marks for each part that will be outside of the die. Hopefully you can see mine in this picture. Using your scissors or a craft knife, cut from the edge of the paper to where the mark touched the die being careful to cut just along the edge of the image. Then cut around the outer edge of the image, or you can leave the final trimming to do after the next step. In this picture you can see I have already cut around the flower, but have not cut around the leaf yet. Carefully slip this portion of the image inside the die and over the edge so it won't be cut when run through your die cutter. Slip the die into place over your image. Run the die and image through your die cutting machine. It will look like this when you remove it. Remove the die and finish cutting around the edge if you did not already do this. Erase pencil marks. Now you are ready to color with your favorite markers. Once your image is colored, use any materials you wish to complete your card. Well, that is it. What do you think? Thank you so much for visiting and trying my tutorial! 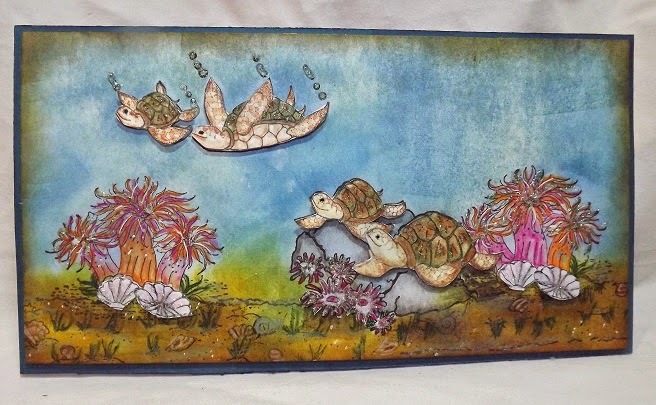 I started this card by stamping and masking three different Great Impression stamps; G335 Sea Turtles, E651 Sea Anemones and F454 Swimming Turtles Next I used a brayer to create my sea floor and my sea using several different dye inks. After brayering, I stamped in the sea floor using F270 Sea Shore Stamp. After all that brayering and stamping I started coloring in my images, using my fav Prisma pencils. I made several extra images so that I could pop all the turtles, some twice, as well as the flowering anemones and some shells. I added in some white highlights using a white paint pen and then added some crystal Stickles and some shimmer with my glitter pen. I then inked the edges with some dark brown ink and called it done. The final step was to pop the scene and mat it onto a piece of turquoise blue paper. Hi, friends! I'm back with another card featuring stamps from the Great Impressions store! 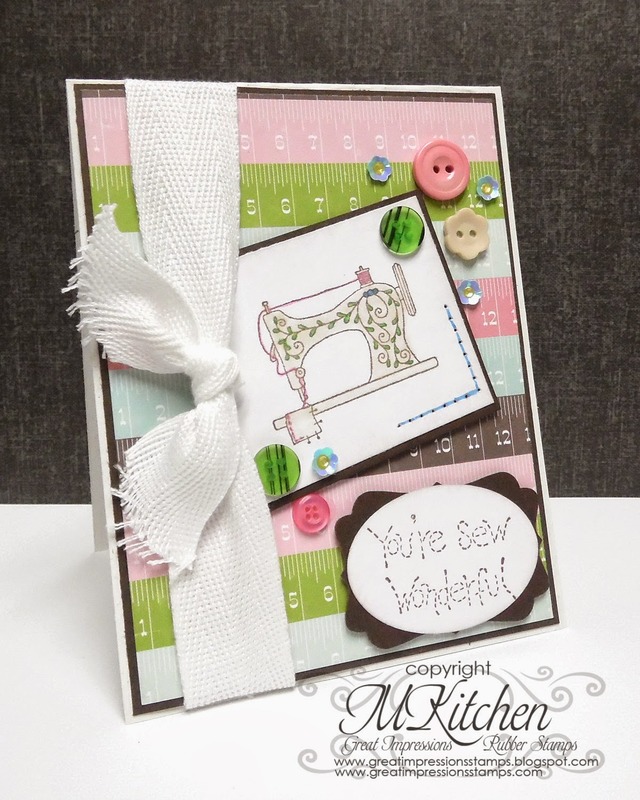 This time I have a soft, pastel card with a sewing theme and a punny sentiment--I LOVE me a good pun! Products used: D433 Sewing Machine, D431 Sew Wonderful. I colored the image with copics then die cut some layers to add interest. Flower was also made from a die. Hi ya peeps, today for my inspiration I* decided to create a simple card. chirping. 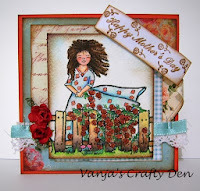 I thought a spring card was in order for today. embellies and a pretty felt bird. 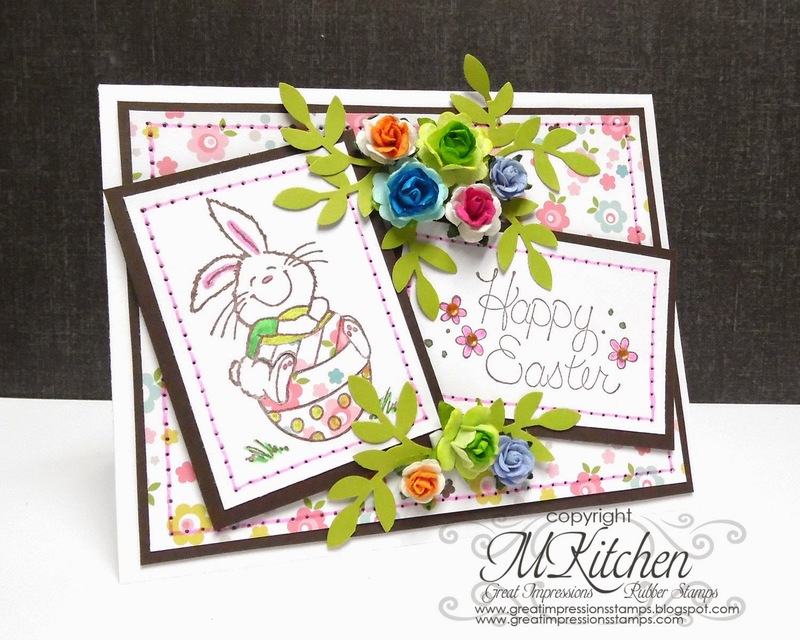 A simple and spring like card. share a creation on out FB page. Happy crafting! 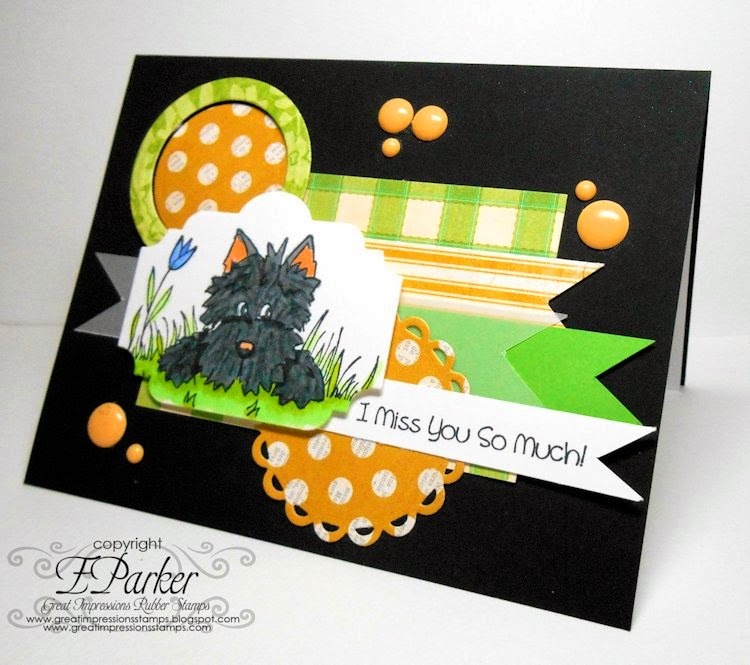 Kendra from Luv 2 Scrap 'n Make Cards here today to share a card with you that I really enjoyed making!! One of my absolute favorite things about spring is starting to see my flowers come up and bloom! 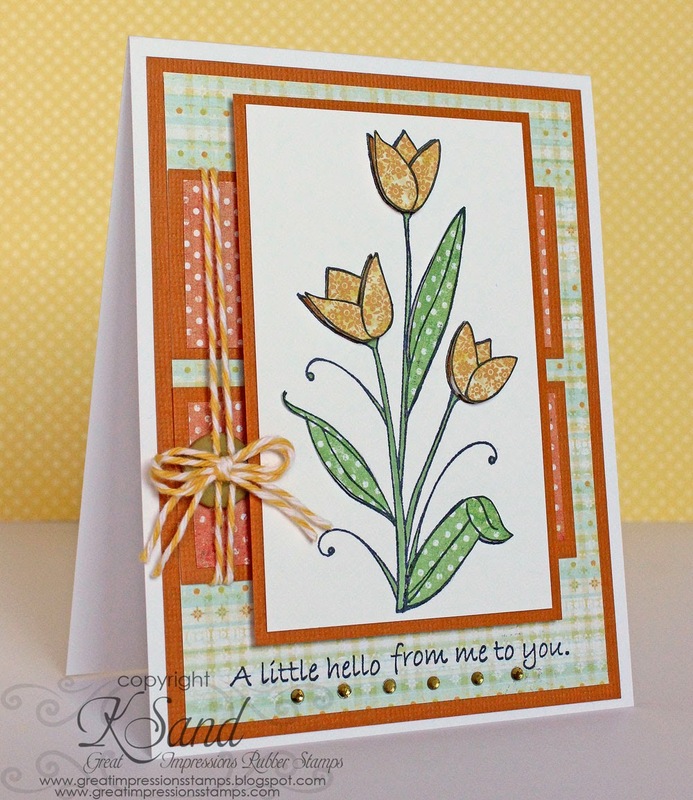 With that being said, the Lily's Garden (H10) stamp is a must have for anyone who loves flowers!! Isn't this such a beautiful image?! I also used the For Someone Special (A109) sentiment! Thanks so much for stopping by for a bit of inspiration from Great Impressions. Be sure to check out the current monthly challenge (starting tomorrow) and don’t forget to link your GI creations at our CUSTOMER GALLERY! Hi, friends! I'm back with another card featuring stamps from the Great Impressions store! 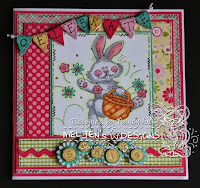 This time I have one last card for Easter using a DARLING bunny image and some fun colored flowers! Isn't he darling and perfect for Sunday's holiday?! 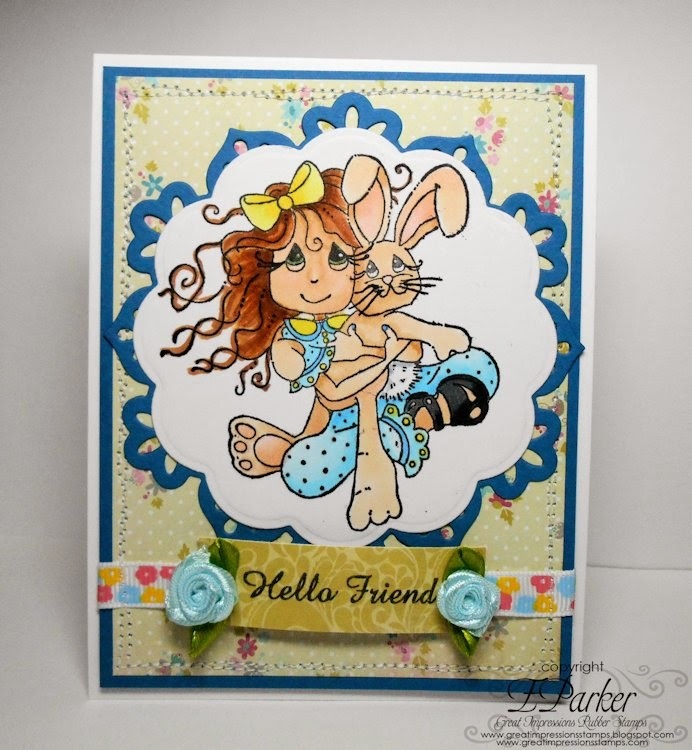 Products used: E578 Happy Easter Blossoms, E529 A Bunny Hug. It's my inspiration day and I wanted to share my take on triptych art. and I finally did it but it's in four pieces and not three. It's the thought that counts so I am pleased with the results. the technique. It's all about spacing, framing and choice of art. 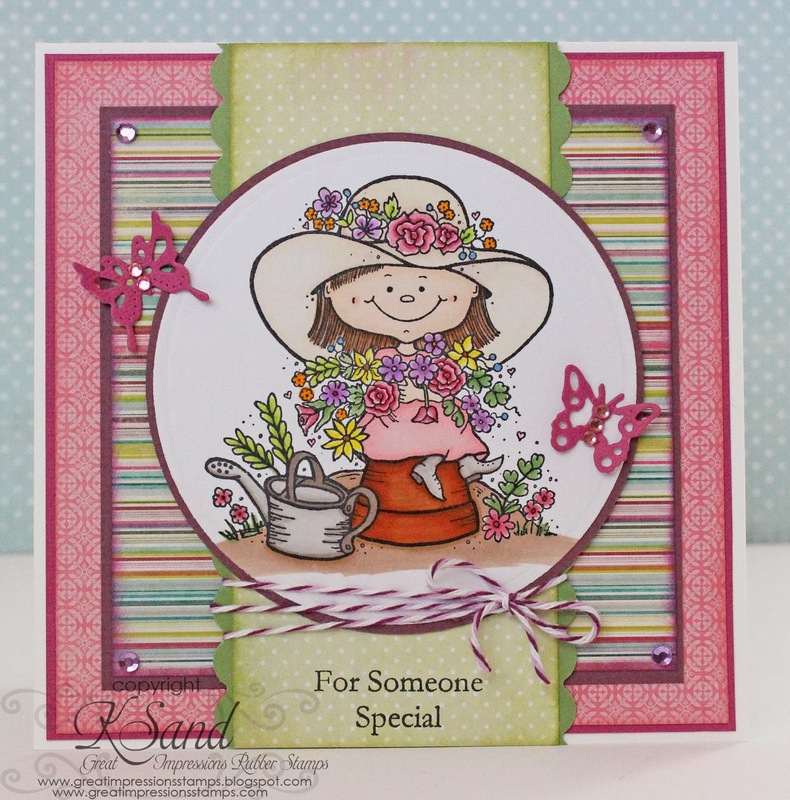 The stamp I used is called F555 Bucket of Flowers. typed words for the sentiment. Thanks so much for stopping for some inspiration from Great Impressions. Be sure to check out the current monthly challenge and don’t forget to link your GI creations at our CUSTOMER GALLERY! 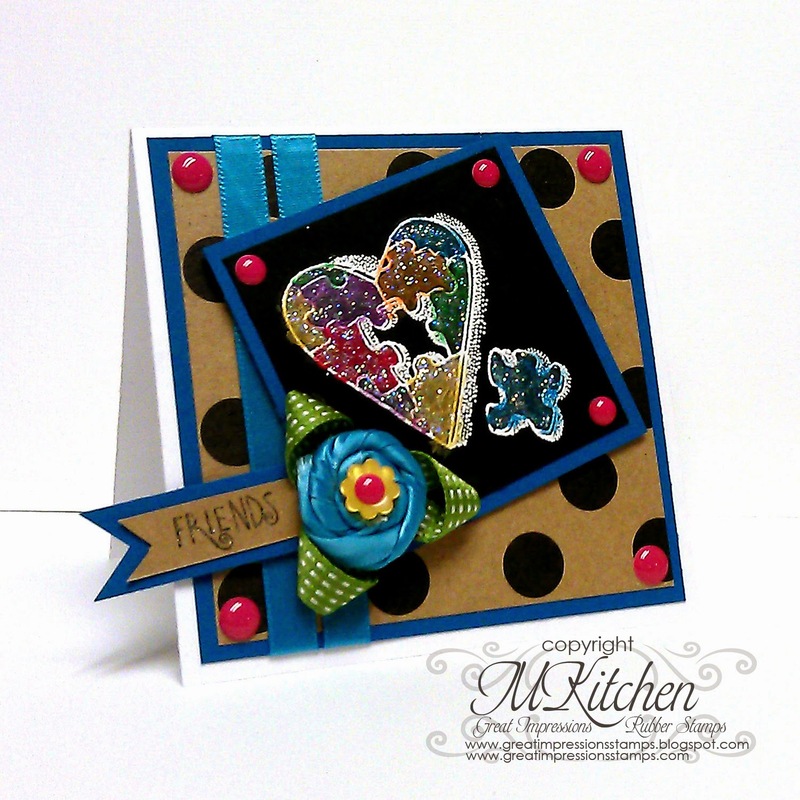 Our current monthly challenge is Polka Dots, Pink and Glitter! Be sure to join in, we'd love to see what you create! I used the Floral Cake (E819) for my main image! Yummy!! 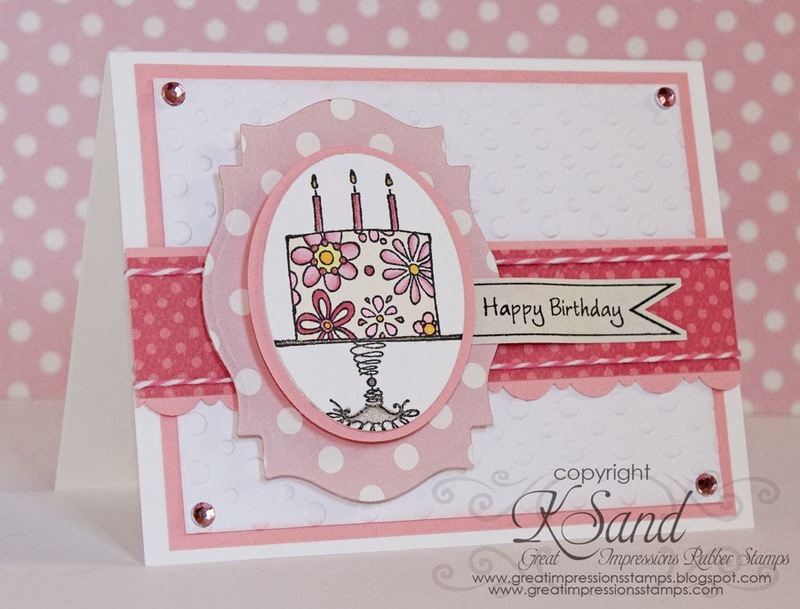 The "Happy Birthday" tag is from the Tags Rubber Stamp set (G483). I think Gracie is just adorable with her bunny! Don’t you? 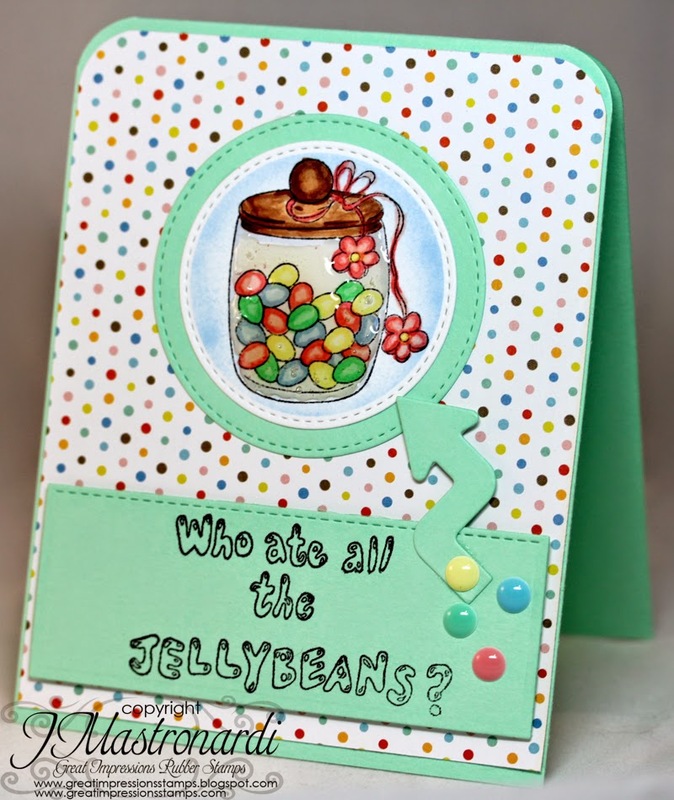 Today I'm sharing a classic Easter tag using E747 Easter Greetings. 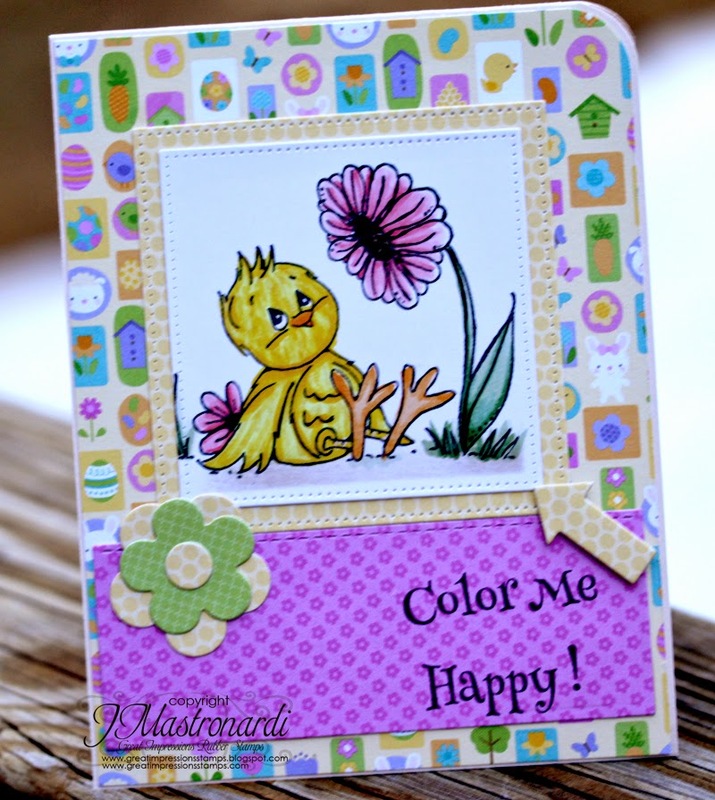 It's another of my favorite Easter stamps. It works inside or on the outside of a card. 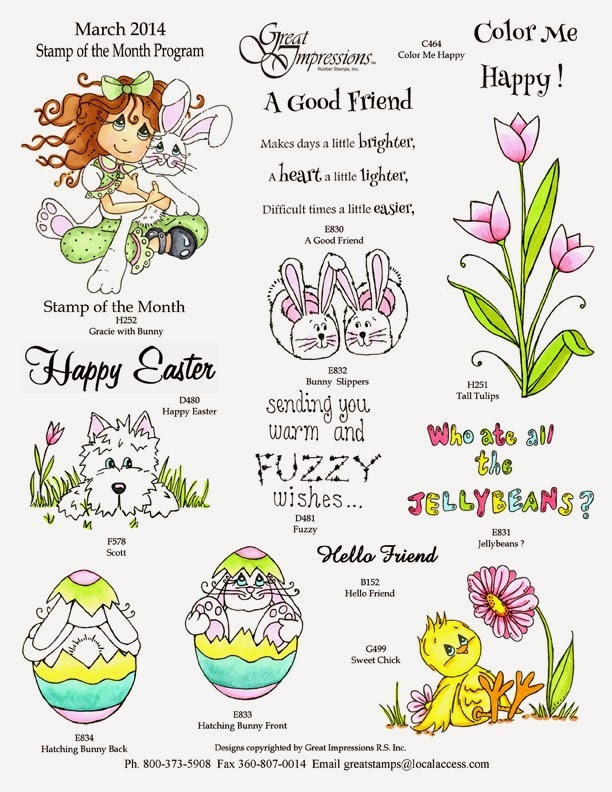 I stamped E747 Easter Greetings 4 times and colored then popped the different layers using dimensional tape. 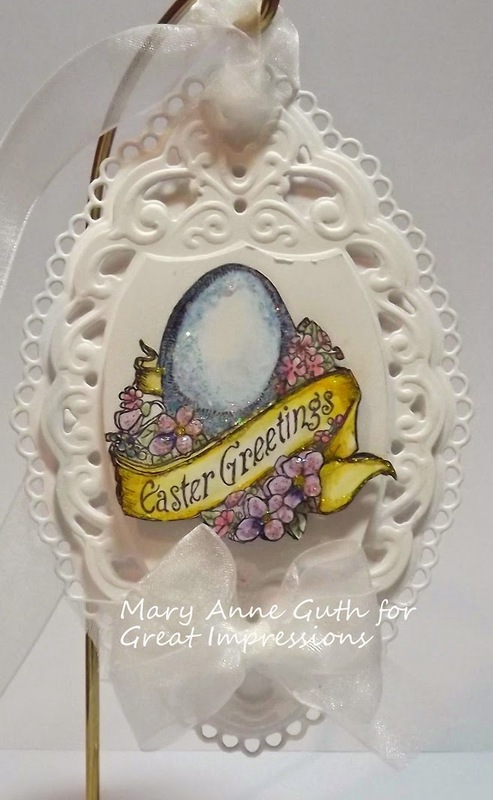 After mounting it on beautiful Egg shaped die I added lots of sparkle with Stickles; I wish you could see how it absolutely shimmers in the light. Finally a pretty bow was added and now it's ready to be attached to a chocolate bunny or Easter Basket. Products used: F572 Heart Puzzle, B233 For Friends. Well it is finally warming up here in NH. So maybe we can Enjoy the Day. 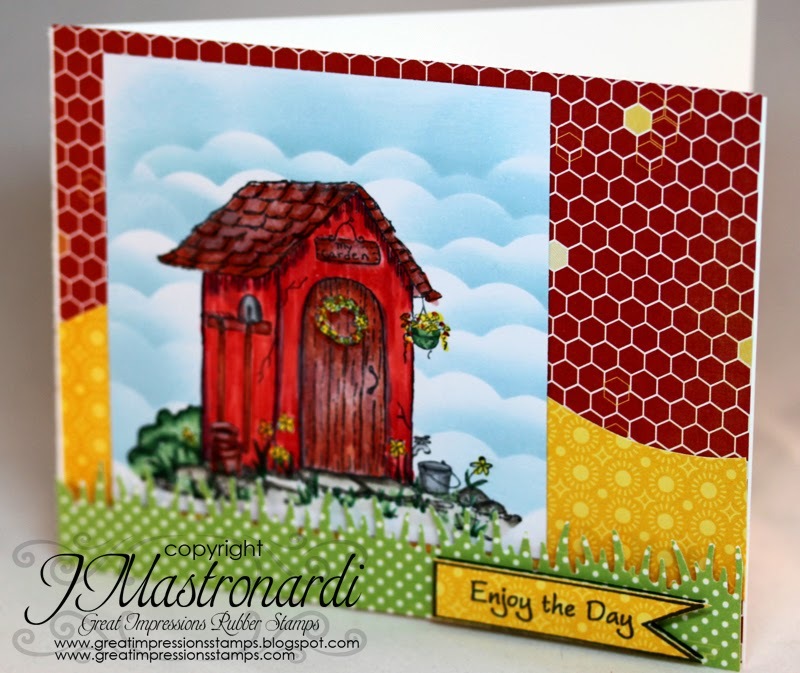 I stamped the main focal image: H196 Garden Shed with Tuxedo black ink and colored it in with copics. I used part of the G483 Tags Rubber greeting to make the sentiment. With some dies I created the background scenery. that is simple and sweet. stamps are way too busy to try to color. stamp is one I LOVE. types of flowers and that the image also includes a watering can. It's picture perfect! I colored this up using Prismacolor pencils and a turpenoid solution.